Hot on the heels of their success with The Icebreakers Pocketbook, authors Paul Tizzard and Alan Evans have once again harnessed their enthusiasm and creativity to write The Openers & Closers Pocketbook - a collection of themed and non-themed activities to give training workshops effective and memorable beginnings and endings. 'This is a selection of short exercises and pithy stories to top and tall courses', says Tizzard. 'We've included quick icebreakers and lengthier, more involved activities, as well as short anecdotes to set the tone.' 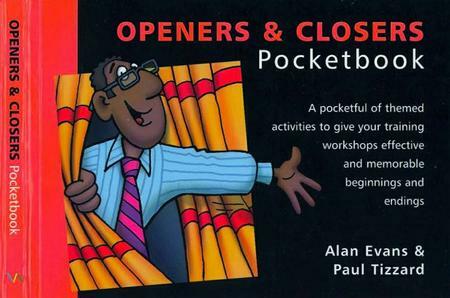 The emphasis of The Openers & Closers Pocketbook is on simple activities that require the minimum amount of preparation - in the authors' words, 'grab and go' activities that will give trainers new and imaginative ways to enhance their training delivery.